WISP 1570 AM operates out of Doylestown, PA with 5000 Watts during the day and 900 Watts after dusk. 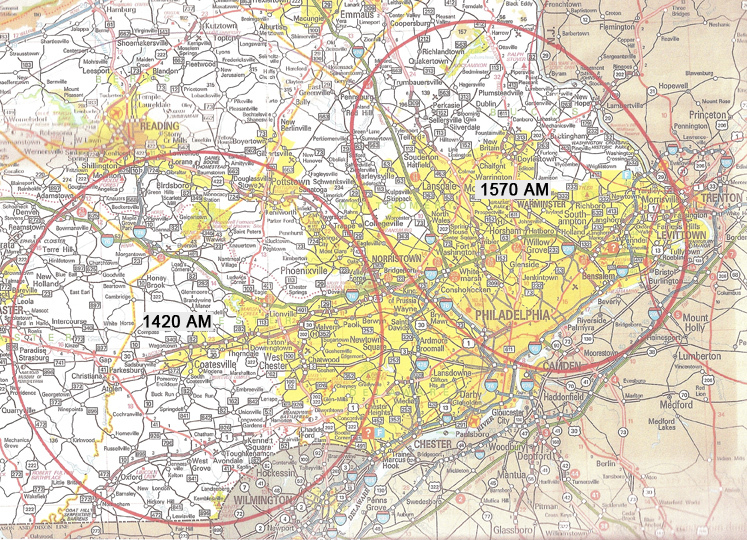 WCOJ 1420 AM operates out of Coatesville, PA with 5000 Watts during the day and night. The main studio for the two stations is located at WISP in Doylestown and the signal is simulcast on WCOJ in Coatesville. Use batteries instead of plugging the radio into the wall. This helps eliminate static that can be caused by electricity in the surrounding area. Try positioning your radio in different parts of the house or room, rotating the radio for best reception. Unlike FM radio, the AM signal is directional and may require some unique maneuvering. Turn off florescent lighting or any appliance that may be causing static interference.